Configuring, monitoring and maintaining the highest performing Metro Ethernet Forum (MEF) certified 100+ Mbps Carrier Ethernet and the industry’s only DS3 over bonded copper products, is made intuitive and straight forward with the Positron’s Element Management System (AKEMS). AKEMS provides a clear view of high bandwidth, high reliability, exceptional reach copper bonding products such as the AK500S, AK62x and AK355. AKEMS provides a comprehensive set of features that meet high standards for reliability, scalability and availability and make it possible to quickly install, monitor and maintain Positron’s products from a single management interface. The AKEMS provides a carrier grade set of standard Fault, Configuration, Accounting, Performance, Security (FCAPS) element management features such as configuration tools, alarm display and management, performance monitoring as well as security. It supports very large scale deployments by accommodating up to 100 concurrent users and up to 1000 FlexStream network elements per AKEMS server. 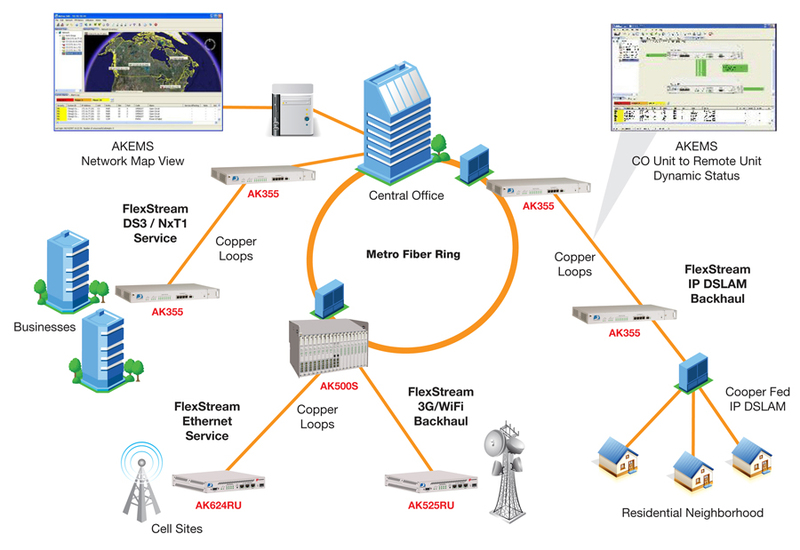 With the goal of making the FlexStream broadband over copper products easy to configure and intuitive to maintain, AKEMS provides a complete inventory of all FlexStream network elements in use and displays them in a tree view. Both the tree and the map views provide a color-coded snap-shot of the alarm status of all network elements facilitating informed troubleshooting. In addition to reporting the alarm status of the network in GUI, AKEMS also generates northbound SNMP based traps and queries to inform NMS systems of the existing alarms and also trigger traps when new alarms are reported.AKEMS provides auto-discovery of network elements, software upgrade wizards for local or remote network element software upgrades and a bulk provisioning feature that facilitates configuring several network elements without duplicating effort. Network element configuration data can also be backed-up and restored on-demand to ensure critical configuration information is archived and can be easily re-installed as needed. Positron’s AKEMS provides easy to understand graphical views of each element along with performance and alarm summary tables. These save network operators significant time and effort when it comes to understanding the current state of the FlexStream products in the network. They include vital network data such as the configuration and alarm status of each of the copper pairs connecting the FlexStream central office and remote units and bandwidth performance per link, essential network information when trying to understand bottlenecks and usage patterns. Positron’s AKEMS provides filtering, logging, report creation and scheduled configuration and management database backup capabilities, which allow operators to schedule automatic backups of performance and alarm data. Up to 30 days of performance management and alarm history can be logged, making it possible to create valuable historical views of network element performance. The AKEMS is designed from the ground up to ensure a smooth integration into a comprehensive network management suite. AKEMS supports both a web service interface as well as SNMP alarm forwarding to popular 3rd party NMS platforms in addition to supporting multiple server platforms such as Solaris, RedHat Linux and Windows.